Erosion control: Timothy can be used with legumes and/or other grasses in a mix for cover purposes, filter strips, waterways, and other critical area applications. Wildlife: Timothy is commonly found in wildlife mixtures for nesting, brood cover, and escape. Phleum pratense L., Timothy. is a relatively short-lived, cool- season perennial that grows in stools or clumps and has a shallow, compact, and fibrous root system. It grows in erect clumps 20 to 40 inches tall. Leaves vary in length from a few inches to a foot and are about 1⁄4 inch wide, narrowing gently toward the tip. Heads are spike-like and dense, from 2 to 6 inches in length. Seed is very small and usually remains enclosed in the glumes. There are approximately 1,152,000 seeds per pound. Timothy is different from most other grasses in that 1 or occasionally 2 of the basal internodes of the stem swell into a bulb-like growth. This characteristic is often used for identification of the plant during is early stages of growth. Timothy is adapted to a cool and humid climate. Timothy thrives best on rich, moist bottomlands and on finer textured soils, such as clay loams. It does not do well on coarser soils. It prefers a pH of 5.5 to 7.0. Timothy will grow for a time on soils low in fertility, but it is better adapted to a high fertility soil. It is not well adapted to wet, flat land where water stands for any considerable time. Under limited moisture conditions, it makes a poor recovery and does not tolerate drought or prolonged high temperatures. Timothy is very winterhardy and has high tolerance to cold temperatures and ice encasement. Timothy is usually seeded in mixtures with legumes. This mixture may be drilled with a small grain drill. If planted with a winter grain, the Timothy is seeded with it, and the legume is planted early the following spring. Seeding depth of Timothy should be 1⁄2 inch. A firm, weed-free seedbed is a key to a successful planting. Common seeding rates are 8 to 10 pounds/acre when seeded alone and 4 to 6 pounds/acre when seeded in mixtures. Timothy is highly responsive to fertilizers, which should be applied frequently in ample quantities. 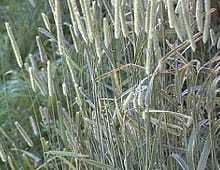 Fertilizer, especially nitrogen, is important when legumes have almost disappeared from the hay or pasture mixture. Timothy stands become weak under close and continuous grazing. A fundamental reason for the decline of Timothy under poor grazing practices is injury to the bulblets. These bulblets form in the spring at the same time the stem elongates. Food materials are stored in them, and they may be destroyed by trampling of grazing animals. Timothy can be initially grazed before jointing and again between early head to full head. Second and successive grazing should also occur before jointing and when basal sprouts appear at the soil surface. After the second grazing, plants usually do not joint; therefore, sprouts are primary guides. Timothy should be cut for hay or silage from early to full head. Make successive harvests for hay and silage when basal sprouts appear at the soil surface. Sterile seed- heads may be 15 to 20 inches up the stems when sprouts appear at the time of second cutting. Growing points stay below ground after a second cutting. Graze or cut to a minimum height of 3 inches or more.